more than to start a suitcase company: they wanted to change the way we look at travel. The history of Cavalet follows the rise of modern air travel—a time when airplanes transformed from cramped and noisy propeller machines to streamlined ships powered by jet engines. Jets could travel higher, faster, and longer than earlier planes. A reduced need for stopovers made trans-Atlantic travel possible. In an instant, the world became smaller and more available to the masses. In the following 20 years, the number of passengers would tenfold and surpass 200 million a year. inspired by Caravelle, an elegant French jetliner and a predecessor to Concorde. Combining reliable function and simplistic design turned out to be a recipe for success. Cavalet flourished, over time becoming one of the largest manufacturers in Europe, with significant exports to the United Kingdom, West Germany, Belgium, Holland, and Switzerland. Over 400,000 suitcases were produced annually in the Korsör factory. Cavalet introduced several ground-breaking innovations such as retractable wheels and the telescopic handle, novelties that competitors soon copied. The company also received several prestigious design awards. But the innovative spirit went beyond the company's products, with Cavalet earning a reputation as a visionary employer. In an interview, one owner was asked about the key to success. He replied that the company had more designers than any other competitor: the 250 employees. Everybody was encouraged to contribute thoughts and ideas, and these were often realized and put into production. Cavalet kept on reinventing itself. 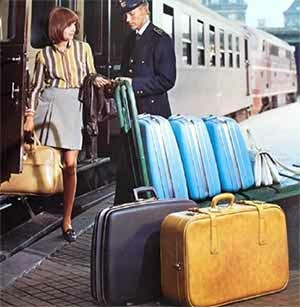 In time the assortment grew to include a wide range of bags and cases, among them the characteristic aluminum-framed attaché case, loved and copied by many. In 1980 Cavalet reached its commercial peak, and the company was sold to the ÖK corporation.